Cary, NC – January 28, 2019 – INDA, the Association of the Nonwoven Fabrics Industry has announced a call for presentations for the ninth annual RISE® (Research, Innovation & Science for Engineered Fabrics) Conference to be held September 24-25, 2019, at North Carolina State University, Raleigh, North Carolina. RISE® 2019 is a two-day conference presenting insightful research and science that propels product development. RISE® 2018 explored forward-looking technologies, concepts, and ideas that offered innovative solutions for current and future industry needs. The exceptional program content included bio-innovations in nonwovens, market dynamics and trends, e-textiles and standards, medical nonwoven developments, web formation and technologies, material science developments and microfibers in the marine environment. Presentation abstracts of approximately 300 words should be emailed to Deanna Lovell, dlovell@inda.org, by Mar. 18, 2019 and include contact information and the relationship of the research to nonwovens or engineered fabrics. Authors will be notified of the abstract’s status within 30 days after confirmed receipt. INDA is also seeking nominations for innovative nonwoven products and technologies for its prestigious RISE® Innovation Award. INDA will consider various categories such as raw materials, roll goods, converting, packaging, active ingredients, binders, additives and end products for nominations. Products should exhibit one of more of the following characteristics: creativity, novelty of approach, uniqueness and technical sophistication. The submission deadline is July 15th. 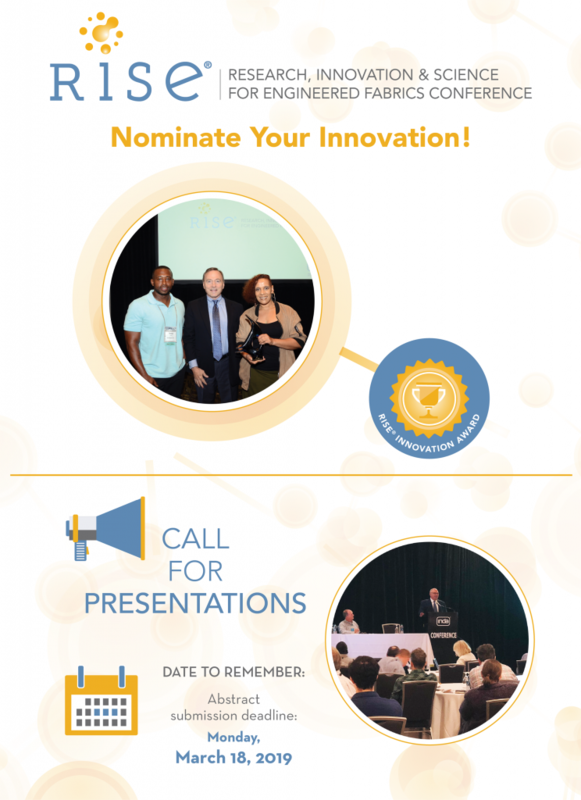 Three finalists will be chosen to present their innovations to technology scouts, scientists, researchers, and next level industry professionals on Tues., Sept. 24th. Last year, the 2018 RISE® Innovation Award was presented to DiviDiaper for its innovative design helping to prevent and reduce both infant and incontinence-associated dermatitis in adults, urinary tract infections, catheter-associated urinary tract infections and other infections and pressure sores. For questions regarding the RISE® Innovation Award, contact Justin Gutierrez, jgutierrez@inda.org, T: +1 919 459 3725.